HONG KONG – Two Canadian cyber security entrepreneurs say that the government’s Trade Commissioner Service (TCS) was crucial in introducing them to clients in the Hong Kong market, quickly leading to a foothold of business in the broader region. 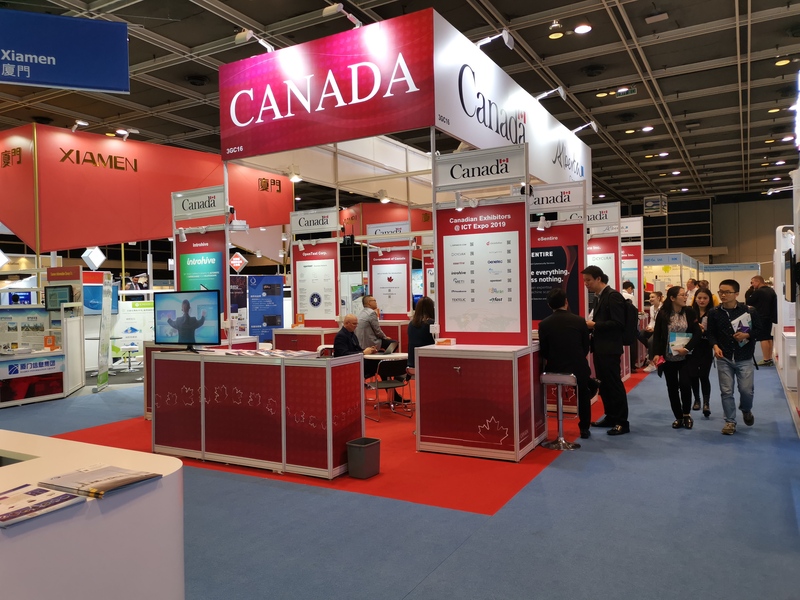 At the ICT Expo 2019 at the Hong Kong Convention and Exhibition Centre, hundreds of vendors hock their wares at booths across a huge expo hall. Amidst them is a large multi-booth unit flying the Maple Leaf, bringing together Canadian software firms from across the country and several different solution categories into a tight package. The mission comes as Canada is extending its efforts to open up the Asian market to startups from the Great White North. Four Canadian Technology Accelerators are planned for the region, with two already opening near the end of last year in Taipei and Singapore, and Hong Kong and Tokyo anticipated to open soon. Modelled after the accelerators the government has already deployed to key U.S. markets, the goal will be to bring over dozens of startups to the region and connect them with the right people. And TCS was instrumental in making connections for Eldon Sprickerhoff, founder and chief innovation officer, at Cambridge, Ont.-based eSentire Inc. and Iain Paterson, managing director at Toronto-based Cycura Inc. Both say that getting involved with trade missions to Hong Kong lead to a healthy business in the area. One that both hope to grow by meeting new prospects at the expo. eSentire now has a couple dozen clients in Hong Kong, he says, and another dozen in Singapore. Hong Kong is a 15-hour direct flight from Toronto, so he’s not making the trip every week, he jokes, but he’s currently on his fifth or sixth trip into the region to do business. For Paterson, it’s his second time visiting Hong Kong. He agrees this sort of trip wouldn’t be possible without the TCS. For entrepreneurs that want to get involved with TCS missions to Hong Kong or elsewhere, Sprickerhoff and Paterson say it’s as easy as reaching out to your local trade commissioner and starting a conversation. Hong Kong ranks third as a global destination for Canadian services exports, worth $2.9 billion in 2017, according to TCS. It’s the second most popular location for investment in Asia, worth $10.6 billion in 2017. The Canadian ex-pat community in Hong Kong is quite large, with more than 300,000 Canadian citizens living abroad there. A Canadian Chamber of Commerce in Hong Kong has 1,200 members. As a next step, Paterson is interested in the opening of the Canadian Technology Accelerator in Hong Kong. The local trade commissioner in Toronto reached out to ask firms with experience in the market if they’d be interested in participating. “It’s an opportunity for us to get further exposed to the Hong Kong market,” he says. For Sprickerhoff, who’s also collaborated with Canadian Technology Accelerators in the U.S., taking advantage of government services to access foreign markets is just a common-sense move. IT World Canada spoke with TCS staff on background for this story. Brian Jackson’s travel and accommodations to cover the ICT Expo and Internet Economy Summit were paid for by the Hong Kong Special Administrative Region. This story was not reviewed externally before publication.